A simple hanging coat rack with half a dozen pegs becomes a perfect destination for necklaces and bracelets. By hanging them up you’ll keep them tangle free. This coat rack can be put on the inside of a closet door or right next to a dresser. A pegboard wall is a terrific storage space for garage or basement. 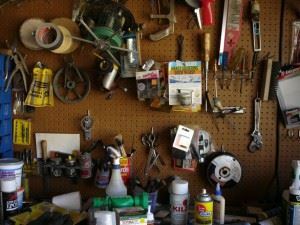 There are hooks of all sizes specifically designed for pegboard that can hang anything from a tennis racket to a bicycle. Once you establish a specific hook for specific item, you can break out the label maker to remind your family this is where that thing goes. A desk organizer that is designed to hold files can easily be adapted for your kitchen cabinets. It’s a great place to store cookie sheets and cutting boards. It also offers easy slide in and out access. Clear Lucite boxes or plastic containers are great for arts and craft storage. It’s easy to put all the crayons into one of these boxes that it is trying to cram them back into the cardboard box. Your kids can also see exactly what’s in each box, which makes cleanup go a lot smoother. Every kitchen has a junk drawer. The same can be said for the bathroom. Both of those drawers can be sorted out with the same desktop drawer organizer. For some reason having separate compartments for all your accessories helps keep them organized. You can assign each family member with their own colored bin. These bins can be placed by the front door for the drop-off of keys, books, mail and other items. They can also be used to drop in the stuff that those family members forgot to. As you go on your organizing task, you’re sure to come across a lot of items that could be tossed out. You might be able to easily fill up your trashcan with some clutter but what about the bigger stuff? When you need to get rid of furniture, electronic goods and other household items that won’t fit in the trashcan, call on Junk King Richmond. These are the junk hauling experts that never met a pile of rubbish they could clear out in a few minutes. Transform your home into a clutter free zone with one call to Junk King Richmond. This entry was posted in Richmond Junk Removal and tagged clutter, Junk King Richmond, junk removal, organizing, rubbish on June 30, 2017 by Junk King. Last updated July 1, 2017 .